Hopefully no one reading this post is my mom. If it IS my mom, I told you to stay off my blog until after your birthday! 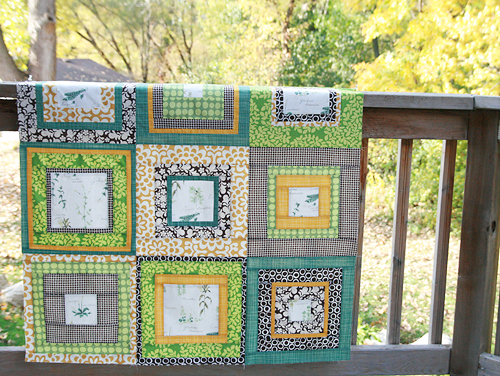 Now that we have that taken care of, this quilt top is to be a surprise for my mom for her birthday in a week! 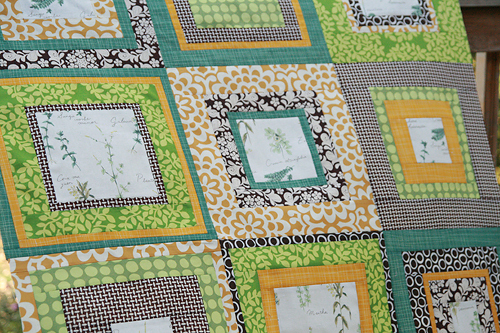 It is based on the fabric in the center of each square, a french botanical print from Japan. My mom loves all things French. And plants. So you see, it's perfect for her. The design is just improvised squares in squares. No pattern, which took longer, but I like the look. I think the colors are perfect for fall, and it looked so pretty out on my deck with the changing leaves. I used a lot of my favorite fabrics - some by Amy Butler, Sandi Henderson, Erin McMorris, Denyse Schmidt, Monaluna and Cosmo Cricket. I'm on a tight deadline, so you should see the finished product by the end of the week!